The VPW3475 is a magnetron transmitter designed for use in instrumentation radar, weather radar, and EMI/EMC field testing applications. 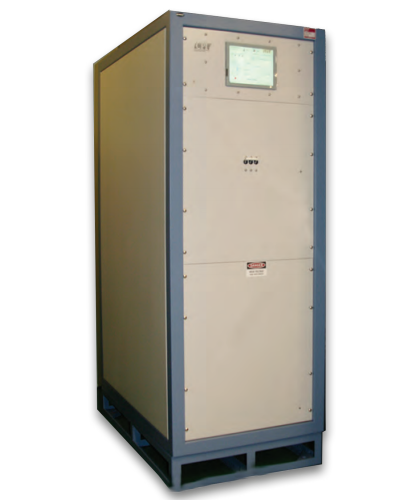 This fully integrated, VSWR protected magnetron system operates at up to 350 kW peak power and uses a CPI coaxial magnetron as its RF output device. Any CPI magnetron with an RF power range up to 400 kW can be used in this transmitter. The VPW3475 transmitter cabinet contains the high voltage power supply, magnetron, solid state switch, and high voltage tank assembly. The cabinet comprises a touch screen controller and a dual-directional coupler, which is part of the CPI control system for monitoring forward and reflected power. The frequency of operation is determined by the magnetron. For additional features and specifications on the VPW3475, download the available datasheet.